If you meet certain income and insurance requirements, you may be eligible for assistance programs that offer free prescriptions – check to see if you qualify! Editor's note: This article was updated on March 1, 2019. 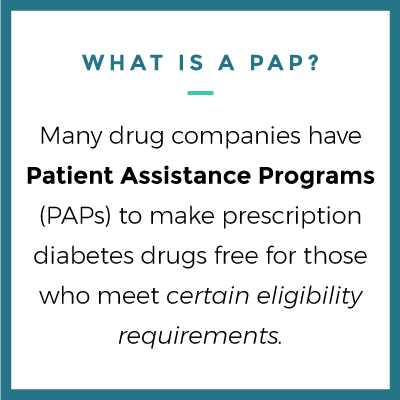 Many people know that some drug manufacturers have Patient Assistance Programs (PAPs) to make prescription diabetes drugs free for those who meet certain eligibility requirements. We’ve done a six-month-long project looking into these programs to better understand how they are similar, how they are different, and who they can and can’t help. These programs are usually reserved for individuals without private insurance or full Medicare benefits, but some programs review applications on a case-by-case basis. What does a PAP application look like? Can I apply to more than one PAP? How do I get my healthcare provider to complete the application? Sanofi and Merck do not require proof of income for their products – among other drugs, Sanofi make Lantus and Soliqua, and Merck makes Januvia. Johnson & Johnson, AstraZeneca, Takeda, Lilly, Novo Nordisk, and Boehringer-Ingelheim (BI) do require proof of income in the form of tax returns, pay stubs, or other statements – some companies may accept a note from the physician or employer confirming income. Most programs have income cutoffs. Takeda has the most generous cutoff at $62,450 for a household of one or $128,750 for a household of four. Merck has a cutoff at $49,960 for a single person or $103,000 for a household of four – while Sanofi has the strictest cutoff at $31,225 for a household of one or $64,375 for a household of four. Most programs require that an applicant does not have private insurance and is not enrolled in Medicare, but one can still be eligible if he or she receives only Medicare Part D benefits. In particular, Takeda (manufacturer of DPP-4 inhibitor Nesina) reviews applications on a case-by-case basis. In addition, if enrolled in Medicare, ruling out Low Income Subsidy (LIS) eligibility, which helps people with Medicare pay for prescription drugs, is a good practice before filling out a PAP. Click here for more information on LIS. Click here to jump down to learn more about application requirements specific to the medication you need. Because PAPs are organized by manufacturer and not specific drugs, you can get assistance for multiple drugs from the same manufacturer without filling out multiple applications. 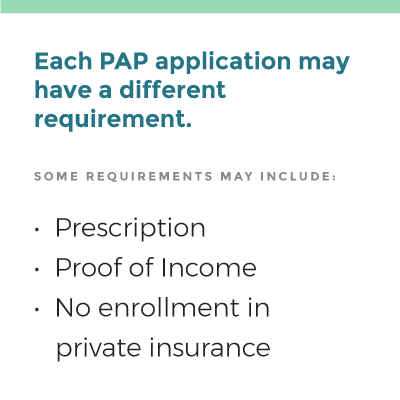 Being enrolled in one manufacturer’s PAP does not prevent you from applying to a different manufacturer’s PAP, as long as you also have a prescription for that company’s drug. 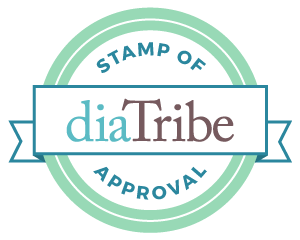 A general rule of thumb is that you cannot use a PAP for a drug while accepting another form of assistance or government reimbursement for the same drug. How do I work with my healthcare provider to complete the application? In addition to your own personal information, fill out everything you can in the rest of the application, even in the healthcare provider section, such as physician’s name, address, phone number, etc. 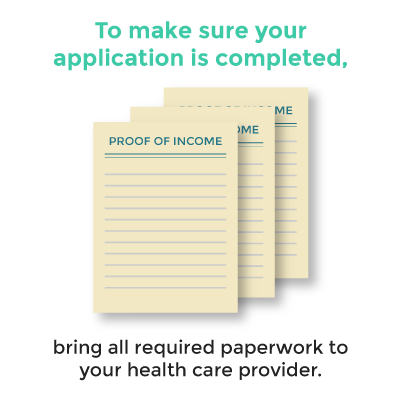 Review the form before going to your healthcare provider’s office so you know what additional documents that the application requires – this will include proof of income (except for Merck and Sanofi’s PAPs), copies of tax forms, proof of Medicare denial, etc. In the next section of this article, you can find the requirements for each PAP. Keep records of your taxes! If you don’t have a copy of your federal income tax return, click here to learn how to get one. Try to bring an addressed envelope with the appropriate postage. You can order postage stamps online here. Emphasize to your healthcare provider that you’ve done all that you can to fill in the forms wherever possible and their help is necessary for you to access the drugs they are prescribing, and that filling out the application would be just about ten minutes of their time! Make copies of the forms beforehand, since you might be asked to leave them behind in the office. Ask when you can follow up to make sure the provider does not have further questions of you (and to kindly make sure the forms are sent). Each drug manufacturer has the same assistance program for all of its drugs. If you’re not sure what company manufactures your medication, click on a diabetes drug from the list below to jump down to details about the associated assistance program. Take this easy quiz to quickly determine eligibility. Must not have prescription drug coverage through private insurance or government insurance like Medicare. Click here for the application, which must be completed by the applicant and healthcare provider and either mailed or faxed. You will need proof of income (two current pay stubs, copy of last year's Federal Income Tax Return, copy of W-2, etc. ), Medicaid or Low Income Subsidy denial (if applicable), photocopy documentation of prescription medicine spending (if applicable). You can write in either your monthly or yearly income. For prescription refills, call 1-800-292-6363, which is open 24/7. The application’s length is mainly due to its large, easy-to-read font – don’t let that deter you! Fairly lengthy: Set aside 10-15 minutes to read and fill out the patient portion of the application. Expect repeated shipments of 90-day supply for duration of enrollment (prescriber must provide a prescription with enough refills). Refills can be requested via phone call to the customer service phone line. Reminders to refill prescriptions are also placed to enrolled participants that opt-in for phone notifications. If enrolled in Medicare Part D, benefits will end on December 31. This application requires more specific monthly income reporting than others, as it asks you to estimate “total household assets.” Check out this article explaining what household assets are. Short length: Set aside 5-7 minutes to read and fill out the patient portion of the 2-page application. 3. Johnson & Johnson Patient Assistance Foundation, Inc. If interested, learn more about how Lilly prices their drugs at lillpricinginfo.com, or by calling (800) 545-5979. Lilly’s medications will continue to be added to this site through the end of February 2019. To apply for Low Income Subsidy, contact the Social Security Administration at 800-772-1213 or go to www.socialsecurity.gov/prescriptionhelp/. Start the application by reading page 3, which has the instructions, background, and eligibility info. Below is information provided by diabetes drug manufacturers covered in this article about the amount invested in each patient assistance program. AstraZeneca has not yet provided any comment to our inquiry. The Boehringer Ingelheim Cares Foundation Patient Assistance Program makes Boehringer Ingelheim medicines available free of charge to eligible patients. People can learn more about the program here. Since the Foundation was founded in 2001, it has donated over $2.2 billion in medicines through its Patient Assistance and Product Donation Programs. In 2017, the Patient Assistance Program helped approximately 50,000 patients in need through over 130,000 shipments. Diabetes medicines represent nearly 25% of the medicines dispensed. Johnson & Johnson donates medicines and funding to the Johnson & Johnson Patient Assistance Foundation, Inc., an independent, nonprofit organization that provides Janssen medicines to U.S. patients who do not have insurance coverage for these products and do not have adequate financial resources. More information about the Johnson & Johnson Patient Assistance Foundation is available at www.jjpaf.org. Johnson & Johnson donated medicines valued at approximately $620 million to support 2016 operations of the Johnson & Johnson Patient Assistance Foundation, enabling the Foundation to provide medicines at no cost to approximately 75,000 patients. Eli Lilly and Company donated $685 million in free medicines in 2016 in the United States, most of which were donated to the Lilly Cares Foundation, a section 501(c)(3) organization that provides free medicines to qualifying patients. The Lilly Cares Foundation Patient Assistance Program, a nonprofit organization, supported 111,000 patients in calendar year 2016. The largest patient populations served were mental health followed by diabetes. The Lilly Cares Foundation provided free Lilly products to 42,000 insulin-taking patients in 2016. In 2016, Merck dispensed 1.7 million 30-day prescriptions valued at $798 million for 306,000 patients in the U.S. Patient Assistance Program. Novo Nordisk was unable to share any information. Takeda has not yet provided any comment to our inquiry. Special thanks to Elizaveta Maslak and Ben Ose for contributing to this article.